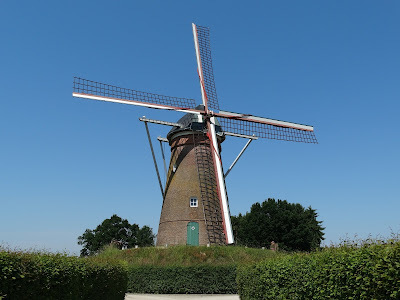 The stone mill is built in 1862 and is the last remaining mill of countless windmills that the municipality of Rijkevorsel once had. Grain was milled here since 1440. The stone mill is an upper cruiser. Only the hood is rotatable to the wind. The artificial hill on which the mill is built is called a millmountain or millterp This makes it easier for the millers to sail up the wing of the mill. The mill hull was built by Jan Hoppenbrouwers, a bricklayer from Rijkevorsel. The mill is equipped with one pair of stones to grind grain. A remarkable thing is the large number of windows in the mills hull and the 3 doors that open the mills belt. The heavy-duty windmill turns on a remarkable English made iron construction. There is also a diesel engine (a Blackstone from Stamford, England) dating back to 1950. The mill is a protected monument since 24 June 1993. You can find the mill at this address: Potbergstraat, Rijkevorsel.